We're honored to feature poems by Matthew Duggan in Issue One of Orson's Review. We're also very fortunate for the time Matthew took to sit down and chat with us about his journey as a poet. *The following interview involves Orson's Publishing (OP) and Matthew Duggan (MD). MD: I suppose my journey with the written word began when I was a small boy. I have always loved reading, and I started writing poems mainly for girls when I was 13 or 14. I received my first poetry book when I was around twelve one Christmas and I haven’t stopped reading and writing since. OP: Is being a poet your occupation? MD: It has been for the last three years but It’s very hard to make a living out of poetry, no matter how successful the poet is, so now and again I take part-time jobs to earn cash for rent and food. Plus, you do need to take a break from writing to concentrate on where the next book/pamphlet is going if the inspiration isn’t coming. OP: Tell us about your process. Do you approach all poems in the same way? MD: Each poem is different. Some begin as a couple of lines and then develop over time, and others are written in a week or two. Some have taken me six months to finish. The approach to my writing starts with a theme and then each line is edited over time until I feel they are ready to submit. I suppose I do approach them the same way. OP: As a child, what did you want to be when you grew up? How has that impacted your poetry? MD: That’s an easy one, I wanted to be a poet from the age of twelve and I remember my school careers officer asking me the same question, and then replying with, "A poet? That’s not a good career path, Matthew." I think he would be quite surprised with what I’ve achieved so far. OP: Tell us about the biggest sacrifices you’ve made while pursuing writing? MD: I’ve made several sacrifices over the years from financial hardship to past relationships that I’ve had to end due to time constraints. Also so called friends that I once respected ended up being envious and manipulated the situation for their own needs. Yet even after all this time their writing still hasn’t improved and they continue to manipulate others and shout about literary elitism, when the real answer to their question is that their poetry just isn’t good enough. I think I’m a lot better off without people like that in my life; I’ll just leave them to stew in their own misery and bitterness. Yet, writing has always been my main and only focus and goal and time has been my enemy when I’ve had to spend every waking hour writing, reviewing, and organizing events. Some days just don’t seem long enough. OP: Do you attend poetry readings? If so, tell us about the best one you’ve ever attended – What made it so good? MD: Yes, I do attend poetry readings when I can, and I also host my own poetry events in my hometown of Bristol. The best poetry reading I attended had to be the Luminous Echoes Reading in Boston in the U.S. because it was my first reading in the U.S. and the quality of the reading was simply brilliant. I’ve also been very kindly invited back to Boston to read at Cambridge Public Library as part of the Poetry Reading Series, and also I’ll be reading in New York and having my first book launch in Philadelphia this April. OP: What do you cross your fingers for as a poet? MD: Usually, when I submit poems to a new journal…where the next pound is coming from! MD: I’d like to achieve a lot more in poetry over the next few years with two new full collections almost finished, that I’m hoping a publisher will accept. I’m also planning on entering more competitions this year and as I write this I’ve just found out today that I’ve been runner up and highly commended for my poem Walking in Clevedon with Coleridge in the Road to Clevedon Pier Poetry Competition. 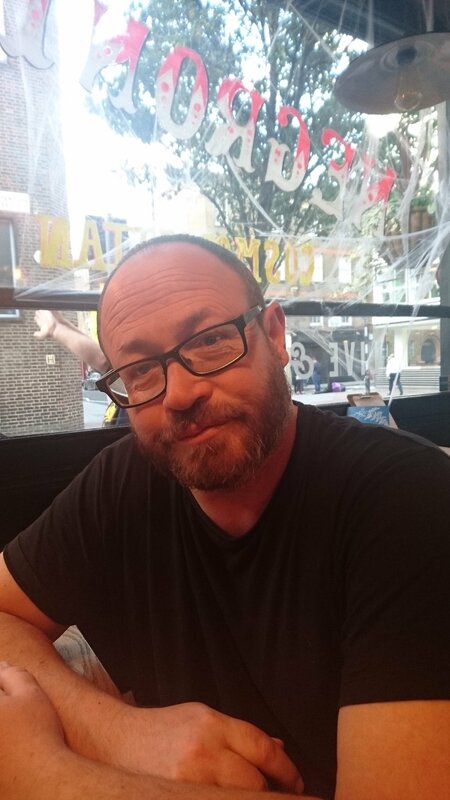 Matt Duggan was born in Bristol U.K.
His poems have appeared in Osiris, The Dawntreader, Ink Sweat and Tears, Lakeview International Literary Journal, Prole, Trafika Europe, Tipton Poetry Journal, and many others. In 2015 Matt won the erbacce Prize for Poetry with his first full collection Dystopia 38.10, and won the Into the Void Poetry Prize in 2016. In 2017 Matt was invited to Boston to read at the Luminous Echoes event and has been invited back to read in Boston and New York in 2018. Matt has a new collection now available called One Million Tiny Cuts and is available from New York publishing house Clare Song Birds. Be sure to check out poems by Matthew Duggan in Issue One of Orson's Review.